Meet one of our clients, Dr Deirdre Gleeson of Medwise. 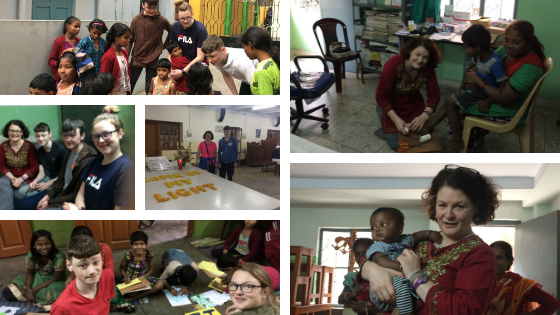 She is recently back from working with the Medwise charity project in India. We thought it was important to let others know about the great work being done by this charity to improve the lives of girls in Calcutta. Medwise sponsors a class of 10 young girls in the Nav Jeevan home for street children in Calcutta. Dr Gleeson, Medical Director of Medwise first travelled to Calcutta in January 2009 to volunteer in a health camp run by the Sisters of the Cross of Chavanod. 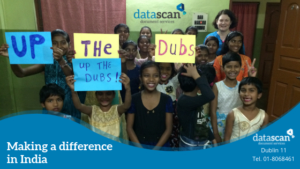 With the help of the Irish Charity Almas, the sisters purchased a small building from which they operate a health clinic, a school, counselling centre and a training centre to help women and children from the slums. The building is called Pratyasha – meaning hope. There is a small flat for volunteers and many Irish doctors, nurses, teachers and helpers have travelled to stay with the sisters and help them with their work. The sisters also run a home for girls born on the streets. The home is called Nav Jeevan which means ‘new life’ and offers these girls, shelter, food, accommodation, education and hope for a better future. Women and girls living on the streets have a precarious existence, surviving by begging, stealing, drug use and prostitution. They live short lives and suffer all kinds of abuse. It is not safe for a young girl growing up on the roadside in Calcutta. Yet the girls love the freedom of the streets and it is difficult for them to settle down in Nav Jeevan and go to school. Their parents visit and encourage them to persist in their studies; sadly some of the parents withdraw their children to go and beg. Dr Gleeson returned to Calcutta several times and in 2013 became involved in a new project at Nav Jeevan to shelter and educate a class of 10 young girls aged between 10 years and 14 years; this is a very vulnerable age for girls living on the streets and the project aims to provide basic literacy and life skills to enable these girls break free from the snares of poverty. It costs a little over €25 per month to feed, clothe, house and educate one of these children. Medwise has pledged to raise at least €3,000 per annum to fund the total cost of running this project. Any surplus funds will go to the charity Almas to help children affected by HIV/poverty worldwide.